There’s no better way to kick off the holiday season in Baton Rouge than with the Festival of Lights. Join us for a holiday celebration featuring beautiful Christmas décor, a snow village, a magical train ride at the Old Governor’s Mansion, a visit from Santa at the Old State Capitol, Reindeer Run and more! 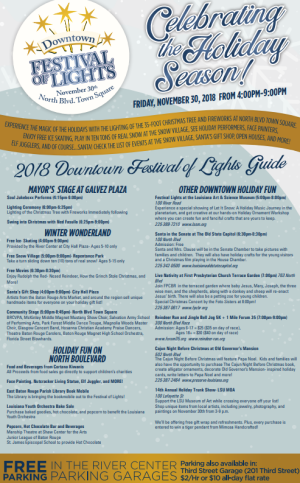 Watch as the magic lights up before your eyes with a fireworks show and the annual tree lighting ceremony in North Boulevard Town Square. For more information call (225) 389-5520 or visit the Event Page.